Product #15713 | SKU P-UCA25 | 0.0 (no ratings yet) Thanks for your rating! The UltraClamp 2.5 allows a camera to be solidly attached to a bicycle handlebar, picnic table, or other similar object. 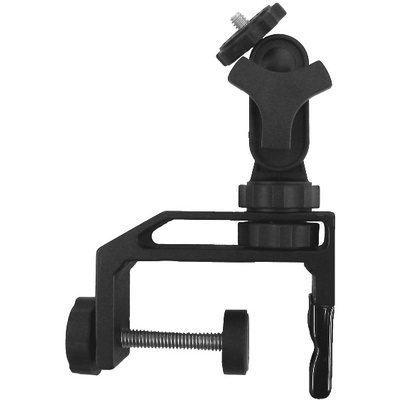 Strong enough to support most cameras, spotting scopes, and camcorders, the UltraClamp 2.5 attaches to round or flat objects from 1" to 2.5" (2.5 cm to 6 cm) thick. The UltraClamp 2.5 utilizes the same ball and socket mount found on UltraPod® II to allow the camera maximum flexibility in framing the subject. The UltraClamp 2.5 has been used for many diverse tasks. Police agencies have utilized it to plant explosive charges and film from the side of a riot shield. Race car drivers have placed it on rollbars to film their laps. We've even seen people mount cameras on motorcycles with it.